Links are to Spanish-language pages unless otherwise noted. Do you use cybercafés to communicate with your family and friends, or for work or school? If you do and you find yourself in Ecuador, under a proposed amendment to the Comprehensive Organic Criminal Code (Código Orgánico Integral Penal or COIP), you may be captured on video while doing so. This new provision, along with new requirements for ISP data collection, has unleashed controversy across the Ecuadorian blogosphere. Its outcome could determine the fate of open Internet access in the country. The proposed law is part of a growing trend among governments around the world to restrict the privacy of Internet users and the free exchange of information, first with anti-piracy laws and then with laws to fight cybercrime—measures that free speech activists fear are actually designed to increase surveillance of citizens by their governments. Examples of this trend are popping up in many countries in Latin America. On a surprising note, similar processes have been used to pass this kind of law in two neighboring Latin American countries of Peru and Ecuador. In both cases, cybercrime-related bills included articles that had not been discussed previously by members of the national congress or assembly, as is the custom. In Peru the law has actually been promulgated, while in Ecuador the executive branch has yet to rule on it. It is in this climate of anticipation that a few important steps have been taken in the tug-of-war over whether to approve or reject the bill. The bone of contention is article 474 of COIP, which mandates that all ISPs store user data (telephone numbers, IP addresses, etc.) and that cybercafé owners install video surveillance cameras to record customers using their services. Legisladores de excelente sueldo, que cuentan con asesores que ganan miles y comités de expertos, pero que ignoran ciertos temas digitales. El problema no es ignorar, pero son “ignorantes digitales” por ignorar voces e iniciativas dispuestas a brindar apoyo por ciudadanos desde la red. Los asambleístas deben legislar en función de garantizar los derechos de los ciudadanos también en plataformas digitales y, en este caso particular, de más 10 millones de usuarios ecuatorianos conectados. Legislators with generous salaries, who have advisors earning thousands and committees of experts, but who ignore certain digital issues. The problem is not ignorance itself, but that they are “digitally ignorant” because they disregard voices and initiatives aimed at providing support to citizens through the Internet. Members of the Assembly should legislate to guarantee the rights of citizens on digital platforms as well, and in this particular case, that means the more than 10 million users connected in Ecuador. In addition to the deep human rights concerns, Article 474 also poses significant economic costs. 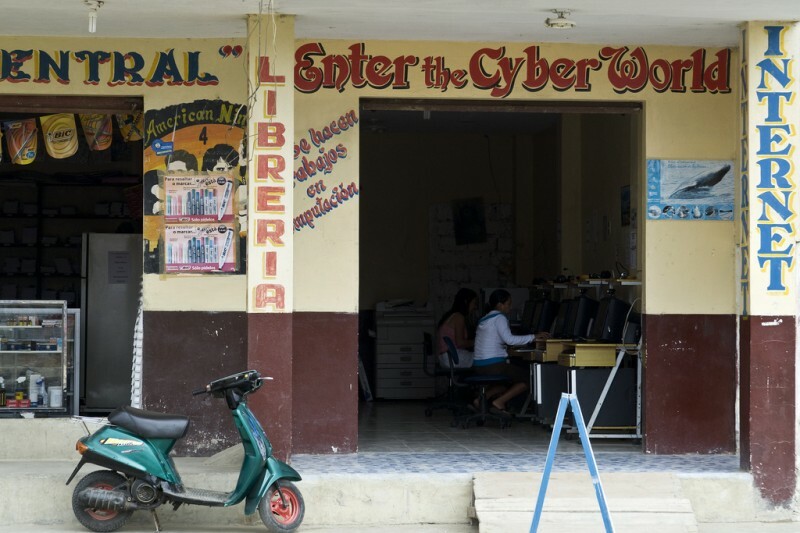 Many of Ecuador’s internet users connect through cyber cafes, often small businesses in the room of a private home. Section 2 of the Article provides that those suppliers and distributors of information also must record the user identification, date and time of connection, as well as record their activities on video, again, for a minimum of six months. The high costs of this provision — from purchasing video recording equipment to storing all user data for at least six months — may prove to be prohibitively expensive for many of these cybercafes, forcing them to go out of business. This would certainly diminish Ecuador's already low Internet penetration rate of 27.2%. Además de las profundas preocupaciones de derechos humanos, el artículo 474 también representa costos económicos significativos. Muchos de los usuarios de Internet en el Ecuador se conectan a través de cibercafés, a menudo pequeños negocios en una habitación de una casa particular. La sección 2 de este artículo dispone que los proveedores y distribuidores de información también deben registrar la identificación del usuario, fecha y hora de conexión, así como grabar sus actividades en vídeo, una vez más, por un mínimo de seis meses. Los altos costos de esta disposición – desde la compra de equipos de vídeo de grabación para almacenar todos los datos de usuarios de al menos seis meses – puede llegar a ser costosamente prohibitivo para muchos de estos cibercafés, lo que les obligaría a cerrar. Sin duda, esto disminuiría la ya baja tasa de penetración de Internet en Ecuador, del 27,2%. Civil society organizations such as Usuarios Digitales, Apertura Radical and Asociación de Software Libre del Ecuador have adopted various strategies with citizens and state institutions, principally the National Assembly, to try to exert pressure on the executive to get it to veto article 474 of COIP. The upshot of this has been the creation of a large coalition called #InternetLibre, rallying other organizations at the national level in a concerted effort to defend the digital rights of citizens on several fronts. In fact, members of the Assembly from different groups welcomed representatives of #InternetLibre and listened to their points of view and proposals regarding article 474 of COIP and others in the bill. It is worth mentioning that some members of the Assembly favour eliminating the article and others only support amendments to it. Ayer 5 de noviembre, usando el hashtag #InternetLibre, más de cuarenta personas reunidas en Quito hablaron de las posibles consecuencias de un artículo incluido en el nuevo Código Integral Penal, aprobado hace poco por la Asamblea Nacional que va pronto a consideración final por el Presidente de la República, Rafael Correa. Entre los asistentes estuvieron miembros de la Asociación de Software Libre de Ecuador, el gremio de software AESOFT, la empresa Thoughtworks, docentes de varias universidades, abogados y los emprendedores de ECStartups. Yesterday on November 5, using the hashtag #InternetLibre, more than 40 people gathered in Quito to discuss the potential consequences of an article included in the new Comprehensive Criminal Code, recently approved by the National Assembly and soon to be submitted for consideration to the President, Rafael Correa. Among the attendees were members of the Asociación de Software Libre de Ecuador, the AESOFT software guild, Thoughtworks, and the faculty of several universities as well as lawyers and entrepreneurs from ECStartups. Basicamente hacer lobby entre los profesionales del sector que sean citados por entes estatales, ya que no han hecho llamamiento o acercamiento a la sociedad civil vía #InternetLibre, pese incluso a que les hemos escrito para dialogar. Adicionalmente tambien contacto con el Presidente, quien en ultima instancia tiene opcion a vetar ciertos articulos del Codigo Penal. Continuar con la campaña hasta tener un compromiso de las autoridades encargadas. Nuestra expectativa es la eliminación del artículo, no su modificación.